has the probe got a cover on it? The probe has a small white cover which protects the tip from any damage and dirt. Although not displayed in the image, this will come with the product while packaged. This requires 2 x 1.5 volt AAA batteries. There should not be a problem using rechargeable batteries aslong as they are the correct size. In environments where monitoring food temperatures are imperative, our Ecotemp Thermometer offers reliable readings every time. Powered by two 1.5 volt AAA batteries, this handheld thermometer features an easy to read digital screen and is functioned through a simple button layout. 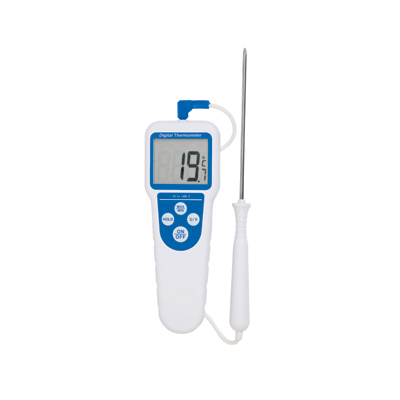 Suitable for monitoring cooking, cooling and food holding temperatures, the thermometer also comes with a detachable penetration probe that can be used for accurate records and accurately notes temperatures between -49.9 to 199.9°C with a 0.1°C/°F resolution. With the ability to display maximum and minimum temperatures along with Fahrenheit and Celsius settings too, this functional thermometer is a reliable addition to your catering repertoire. Here at Gompels, we have a range of different thermometers to suit every need from our reliable Bath Thermometer through to our range of Digital Fridge Thermometers.